What is the Collaborative Practice Center? 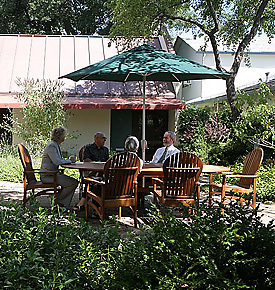 Collaborative Practice Center is an office in Santa Rosa occupied by a variety of professionals, including attorneys, therapists and financial specialists, who work as a supportive team to help clients resolve disputes. Types of issues addressed by collaborative practice include divorce, non-marital relationship break up, domestic partnership dissolution, parenting concerns, spousal and child support, property division, adoption, estate planning and resolution, guardianships and conservatorships, neighborhood disputes and more. CPC is a facility where collaborative practitioners have offices and much more. CPC offers clients and collaborative colleagues a central meeting place, training center, lending library and an atmosphere of mutual desire to learn and help the collaborative principles grow in our community. 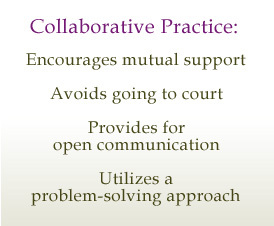 Collaborative Practice is a conflict resolution method in which the participants focus their efforts on reaching a mutually agreeable resolution without going to court. Professionals are retained in the collaborative process for the sole purpose of assisting clients in attaining this goal. The professionals often work in teams which are designed to meet the specific needs of the parties. Attorneys assist clients in understanding the issues to be resolved and negotiating settlements that address the needs and interests of all participants. Collaborative coaches help clients address emotional issues and improve communication skills. Along with child specialists, collaborative divorce coaches help clients develop parenting plans that fit their children's needs. Financial Professionals can assist the parties in understanding the complex financial issues as well as in developing options that best suit their individual situations. What other services are offered at Collaborative Practice Center? In addition to their work in the Collaborative Process, other services offered by attorneys at CPC include mediation, legal representation, litigation, estate planning, guardianships and conservatorships, and adoption. Mental Health professionals provide individual, couple and family therapy, co-parent and blended family counseling, as well as assistance in addressing specific parenting or divorce related concerns. Financial professions provide divorce and other financial planning services.